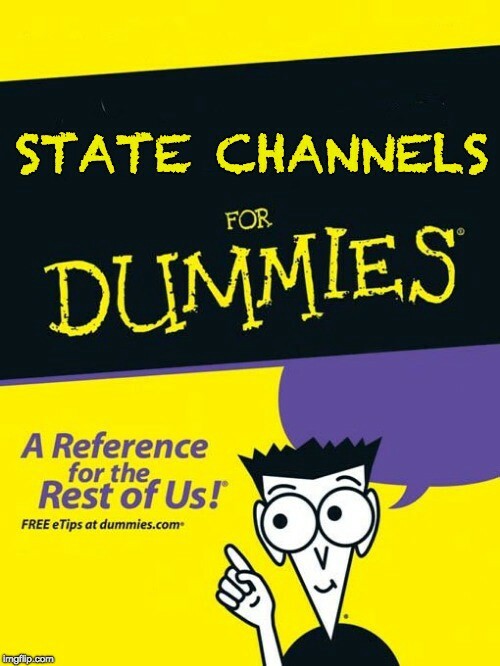 In my last post, I briefly discussed state channels and why I think that they are crucial in the enabling the usability of Ethereum by the general public. Here, I intend to take this one step further with a few posts providing a broad overview of what the guys at L4 are doing with Counterfactual and what that word even means. In this first post, I’m going to be covering the O.G. of the space — payment channels. I was adamant about having this image — no way to make it non-intrusive. Oh, well. So, payment channels have been discussed for some time now and a great reference can be found in the Bitcoin Lightning Network Whitepaper on how exactly these work. If you were to look for a real world example of a payment channel, imagine the following scenario: you frequently purchase food at a restaurant, but only pay in checks (as this is most convenient for you) — whenever a check is cashed, though, there is a $5 fee from the bank cashing the check for the restaurant. Now, with each check averaging ~$15, this is a 33.33% transaction fee, effectively. So, what do we do? In the above example, we see that we can mitigate transaction fees by exchanging newly written checks to account for previously written and destroying the olds ones in the process. In terms of how this works in blockchain land, I’ll explain from an Ethereum developer standpoint, given my background. When creating a payment channel, the two parties must agree to stake ETH to a smart contract (in this case, both Alice and Bob have staked 25 ETH). This smart contract has the ability to accept a transaction signed by one or more parties and pay out the respective amount to both. If both parties take the latest signed off-chain transaction (in this case, Alice: 15, Bob: 25) and send it to the smart contract, the smart contract will instantly update and pay out to both parties. Privacy — Each payment was known only to Alice and Bob, which allows them to have privacy in their individual transactions such that the public only knows the result which has been shared on-chain. ‘Instant Finality’ — Alice and Bob can sign and exchange messages instantaneously without having to wait for confirmation from the chain — leading to a much better user-experience. Lower Cost — Alice and Bob are able to exchange ETH freely with the only on-chain transactions being for creating the channel and settling / closing the channel. One caveat to note here is that each payment channel must have a well-defined set of users when being created. This is needed to ensure that transactions being submitted on-chain have been agreed to by all parties in the channel. In my next post, I’m going to be delving into App-Specific State Channels.